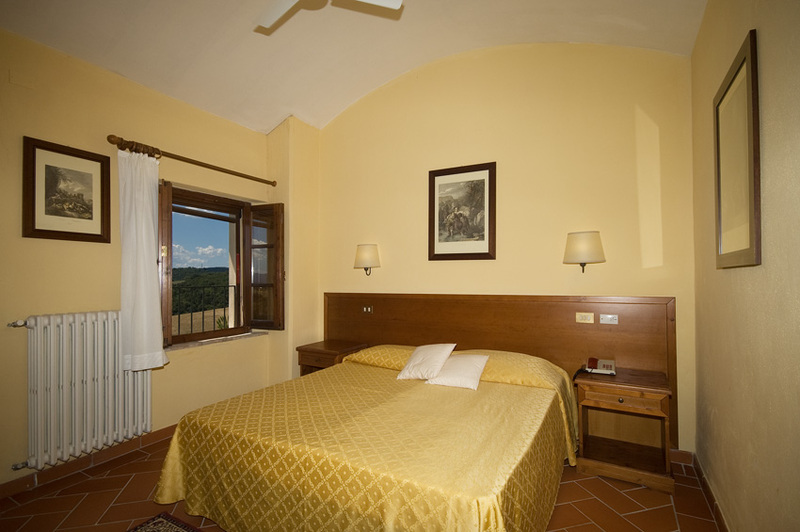 Tenuta di Decimo has comfortable rooms and apartments for a stay in complete relaxation, in the tranquillity of the perfect hills around Siena. The evocative surrounding atmosphere preserves the simplicity and refinement of the past. Breathtaking landscapes: fields of wheat and sunflowers, typical vines and olive trees, fragrances and flavours which are suggestive of a territory rich in history and tradition. Room on the first floor with an extraordinary view of the Tuscan hills; we take care of every little detail, from candles to the small and comfortable Jacuzzi. The room has air-conditioning system and ceiling fan, LCD TV with Sky decoder (cable TV). At your disposal a solarium pool with restricted area. Junior room - smaller but comfortable inside the courtyard, equipped with LCD television, recommended for short stays. Double Room – bathroom with shower, hairdryer, safe box, Satellite TV, telephone and interphone. Two rooms equipped with outdoor gazebo.